As well as doing a Segway tour on Gozo, we explored some of the island by bicycle and then had to return for a third day, this time travelling by bus, as we weren’t able to cover as much ground as we’d hoped by bike, hindered both by the exceptionally hilly terrain and the shockingly poor condition of the gears on our rental bicycles. We spent much of our cycling day around the southern coast exploring the beautiful coastline and riding down narrow lanes between fields separated by dry stone walls. Most of the fields seemed to be grassy but I don’t remember seeing any livestock, although sheep would be the most logical inhabitants based on the terrain. We did spot a vineyard though and a few fields of vegetables. We had a map of the island which showed a roughly coastal route and gave approximate times to either walk, run or cycle four separate sections. We encountered our first problem when approaching the section just to the west of the ferry port – it was a footpath. Hmm, I guess we have to detour by road then… Unfortunately the map only had the major roads marked so we had to rely on the GPS maps on Andrew’s camera to find our way. The second problem was that the suggested times would probably only apply if you were riding a decent bike on a flat, smooth road, taking no account of interest in surroundings or requirement to get off and walk up hills. 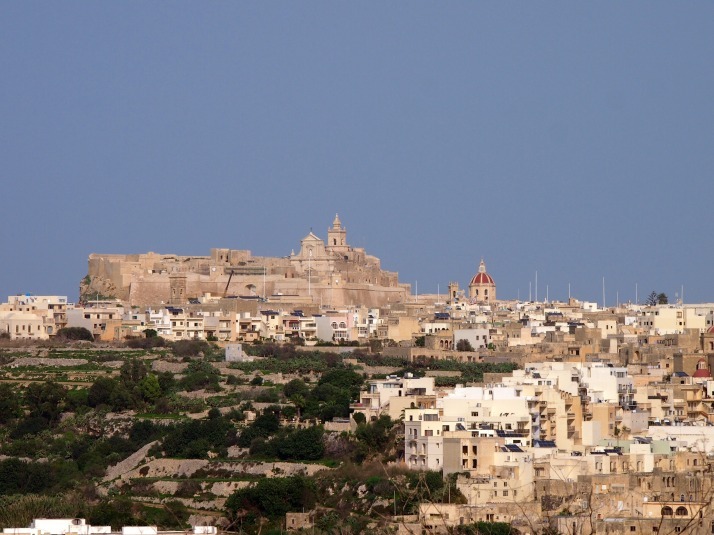 Gozo’s capital city, Victoria, contains a walled town known as Cittadella, similar to Mdina in Malta but even smaller. 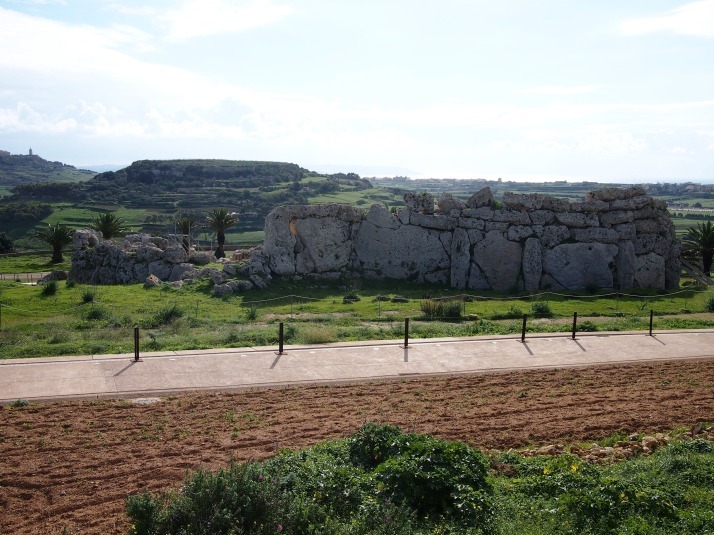 Disappointingly for us, it’s currently undergoing extensive renovation works which mean you can’t fully explore the inner streets and walls, although from the areas where you can get onto the walls there are good views to all sides of the island. 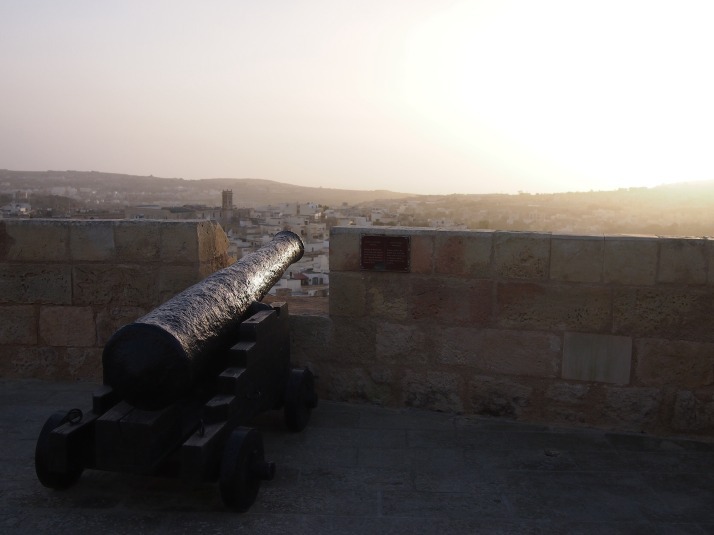 The Cittadella towers over the centre of Gozo. Currently it looks better from a distance from where you can’t see all the scaffolding and piles of building materials. 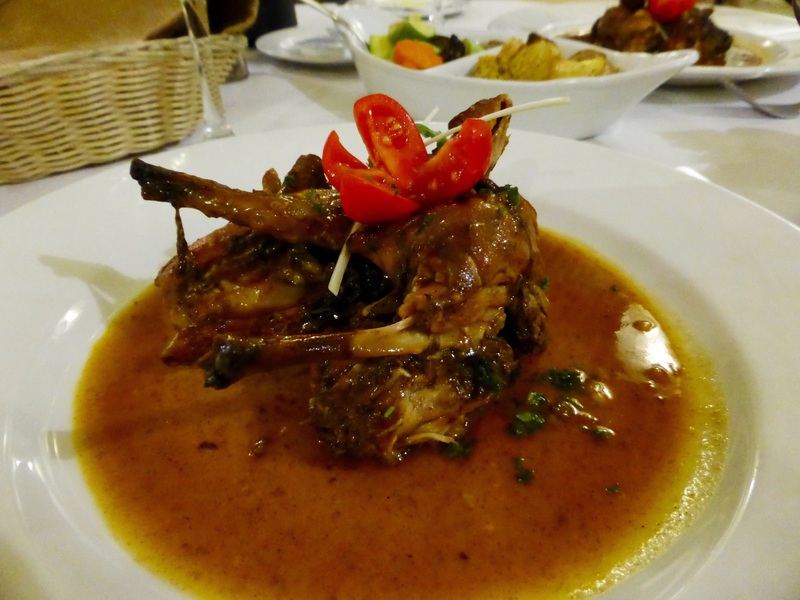 We spent one night on Gozo and that evening, feeling a little saddlesore from a day’s biking, we went out for dinner determined to try the rabbit stew which the Maltese islands are famous for. We weren’t disappointed, with rich gravy and meat so tender it was falling off the bone it definitely lived up to the hype. Similarly to the temples at Hagar Qim and Mnajdra, the Ggantija temples were built by the Maltese Temple Culture around 3600BC. They are the oldest known manmade stone structures on the planet predating Stonehenge by at least 500 years and the Egyptian pyramids by 1000 years. 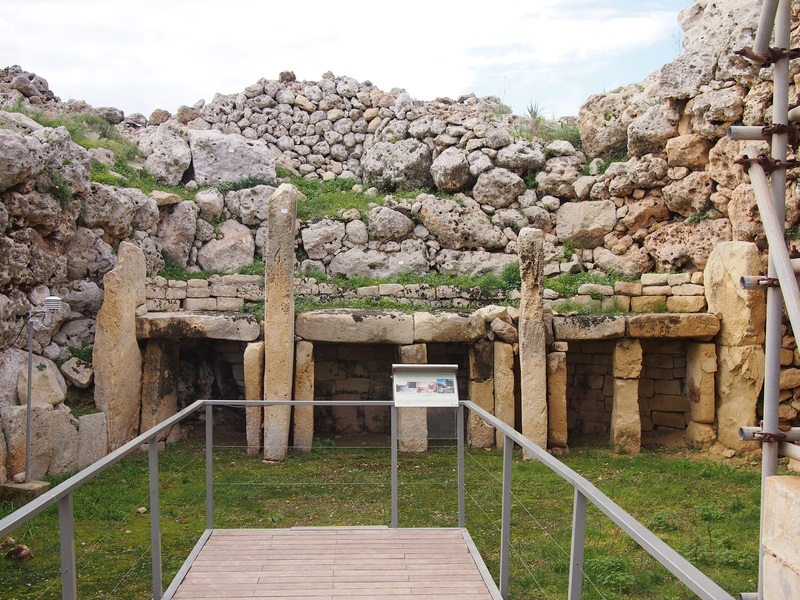 Prior to their excavation in the 1820s, local people believed that the ruins which lay under the earth mound were the remains of a tower built by an ancient race of giants, hence the name which comes from the Maltese word for giant. The complex consists of two temples side by side inside an outer wall and, like the other temples we’ve visited, there are some huge stones used in the construction. Having struggled to move our own weight up some of the surrounding hills, the mind boggles at how the prehistoric builders moved everything into place. 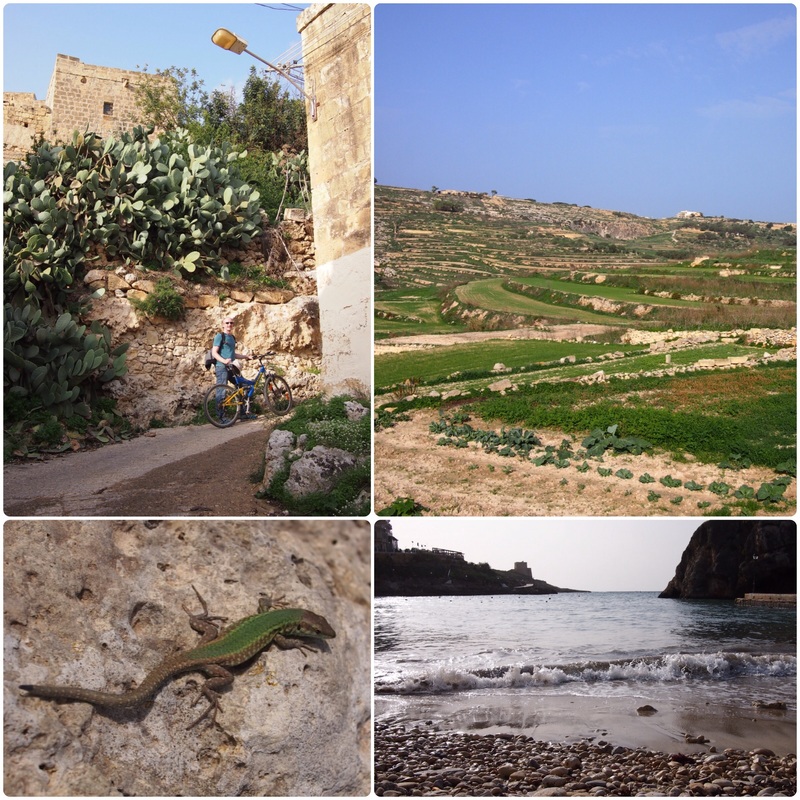 We were aiming to arrive at Dwejra Bay on our cycling day but, although we were within sight of the sea, we got lost amongst the narrow unsignposted back roads and eventually had to give up so that we wouldn’t be riding in the dark. 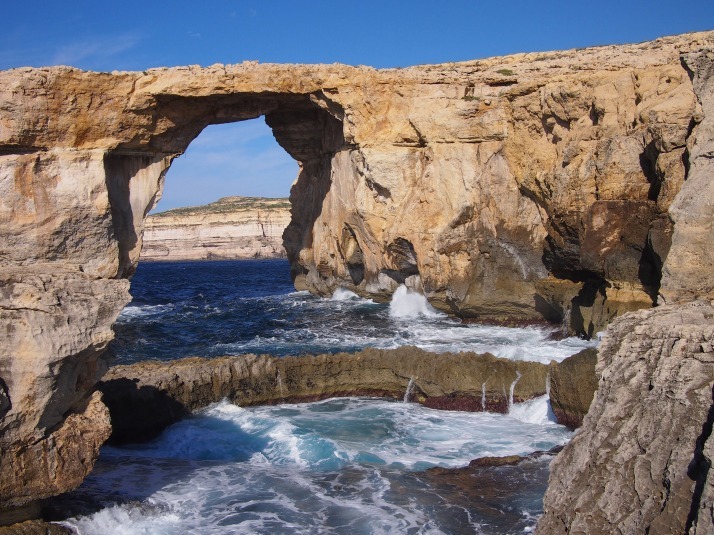 When we finally arrived by bus, we ate our picnic lunch on the rocky beach overlooking the choppy sea around the Azure Window, a natural rock arch which protrudes from the cliff side. 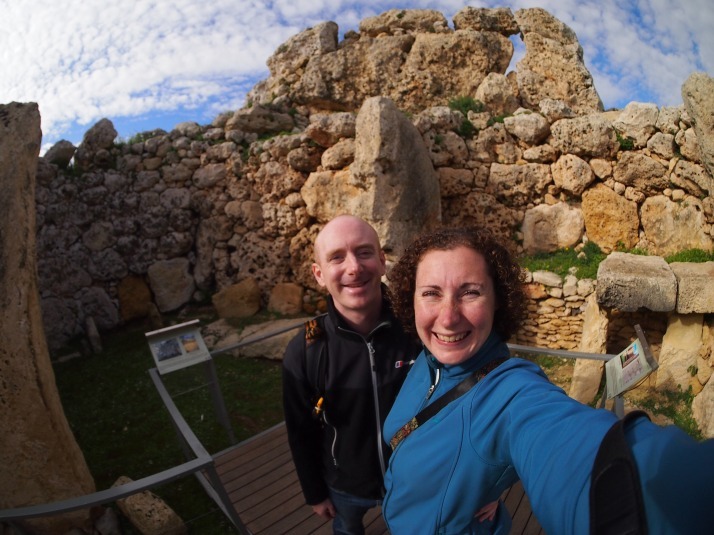 We were hypnotised by the waves crashing on the rocks below us and had to drag ourselves away to climb up the hill to visit Dwejra Tower. Here we watched a short video explaining the history and ecology of the area as well as getting some terrific views along the coast from the roof. 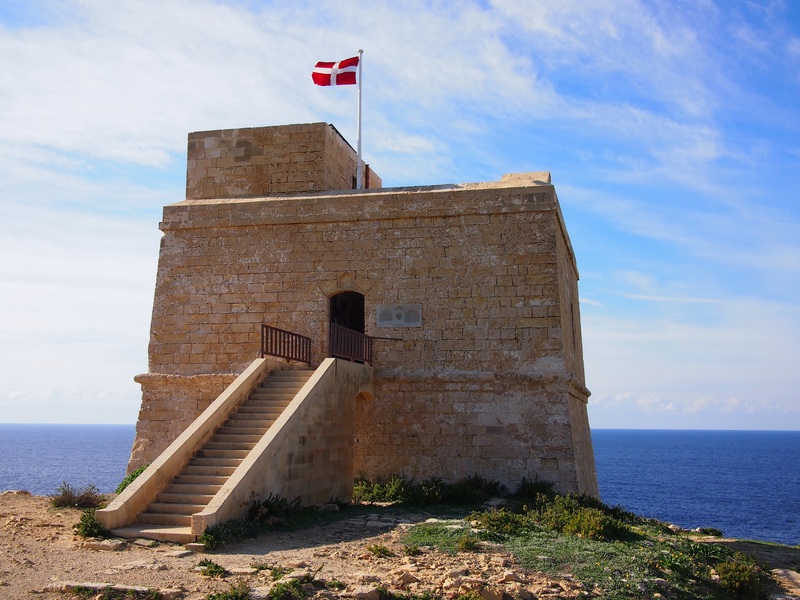 The watchtower was built during the reign of Grand Master Lascaris in 1651, principally to safeguard ‘Fungus Rock’ a small islet in the bay which is home to a plant that was believed by the Knights of St John to have medicinal properties. It was interesting to finally have a look inside one of these coastal defence towers as we have seen a lot of them on our travels around the islands. It was surprisingly small inside due to the thickness of the walls and had only one room on each level. Dwejra Tower flying the flag of the Order of St John. When the flag is raised the tower is open for visits. 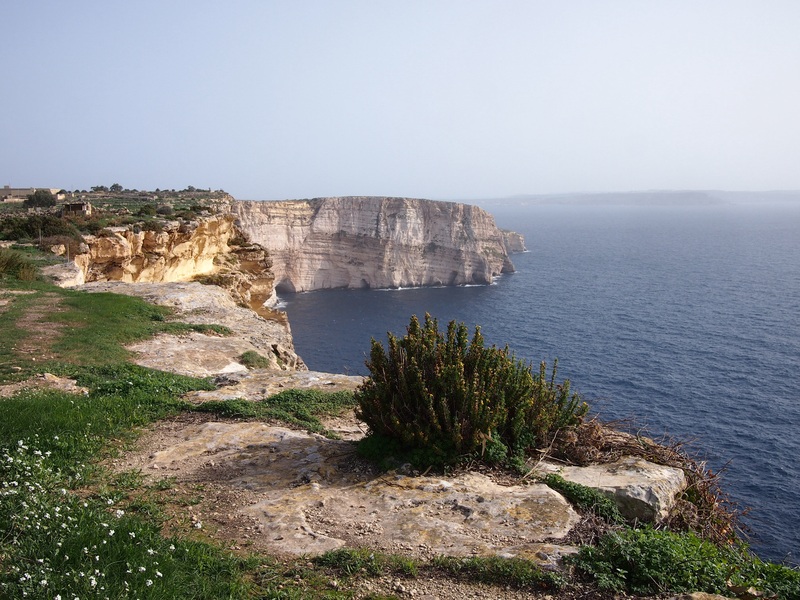 On the other side of the cliff which forms one side of the Azure Window is a different kind of geological phenomenon. A doline called the Inland Sea which, like the almost circular Dwejra Bay, was formed by the collapse of a cave roof millions of years ago. 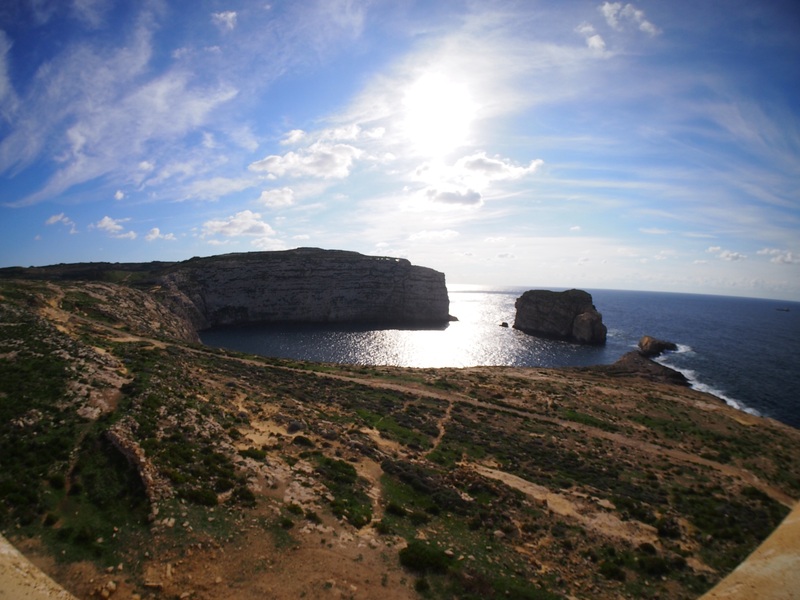 Nowadays it is a popular spot for sunbathing and swimming as well as the jumping off point for boat trips through the tunnel connecting it to the open sea, though in early December with a chill in the air and rough waters assaulting the cliffs none of those activities was in evidence. 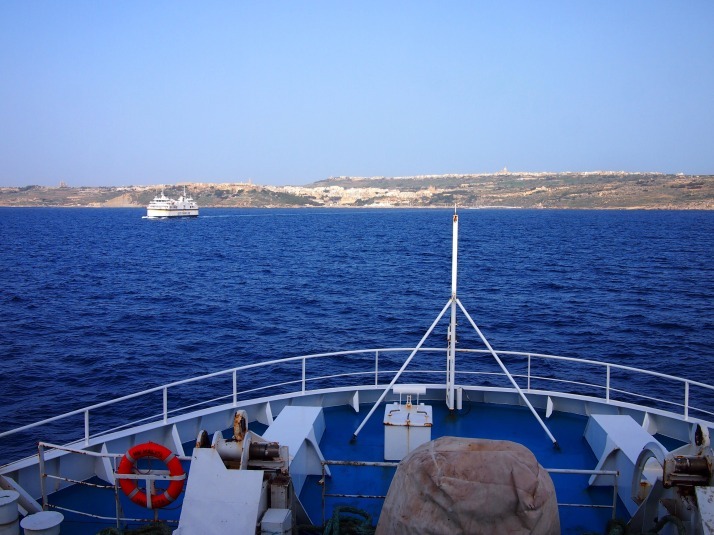 We’re really glad we didn’t miss out on a visit to Dwejra Bay, it was a beautiful end to our explorations and different to anything we’d seen on Malta itself. 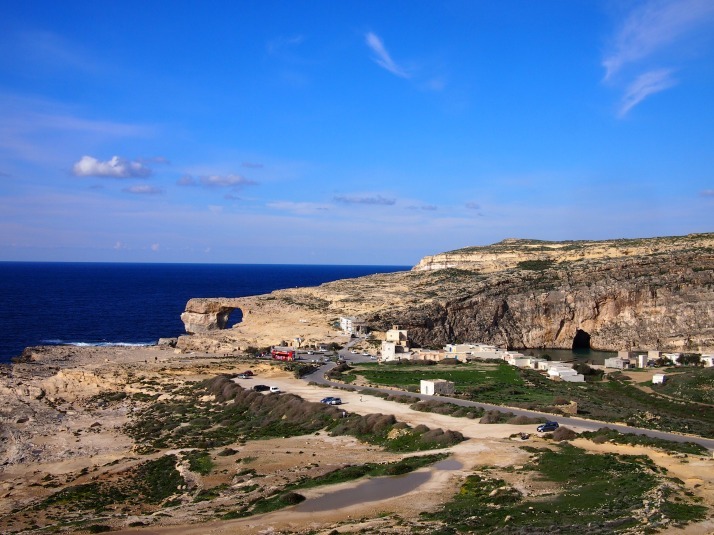 This entry was posted in Places and tagged Food, Gozo, Malta, temple on December 18, 2014 by Julie. I’m also glad you didn’t miss out on Dwerja – it was the last thing I did on Gozo too as it was an easy walk from my hotel and I had time in the morning before moving on to Valletta. You weren’t staying at the Kempinski were you? We cycled past there on the day that we got lost and it looked very swish. Julie, your photo of the citadella from a distance is gorgeous! Where is it taken from? It’s taken from somewhere along the road between Ta’ Cenc and Xlendi as we were cycling around the island. What is 29 + 12 ?